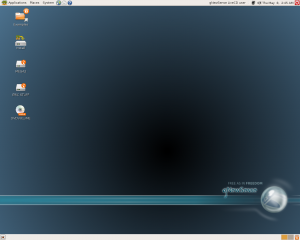 So gNewSense 2.0 came out a few days ago as the gNewSense crew is tracking Ubuntu LTS releases. Of course, the bad part is that there is no upgrade path from gNewSense 1.0 to 2.0. Ubuntu recommends upgrading by going from release to release so upgrading is not feasible (or is too hard for the developers to implement) so freedom lovers need to have a good backup strategy. Since I reviewed gNewSense 1.0, I wanted to structure this review as comparing and contrasting this release to the last one to see where the progress has come. They have a much cooler looking desktop background. There wasn’t anything wrong with the last one – it just didn’t have as much of a cool factor. They still have ugly icons on the screen. 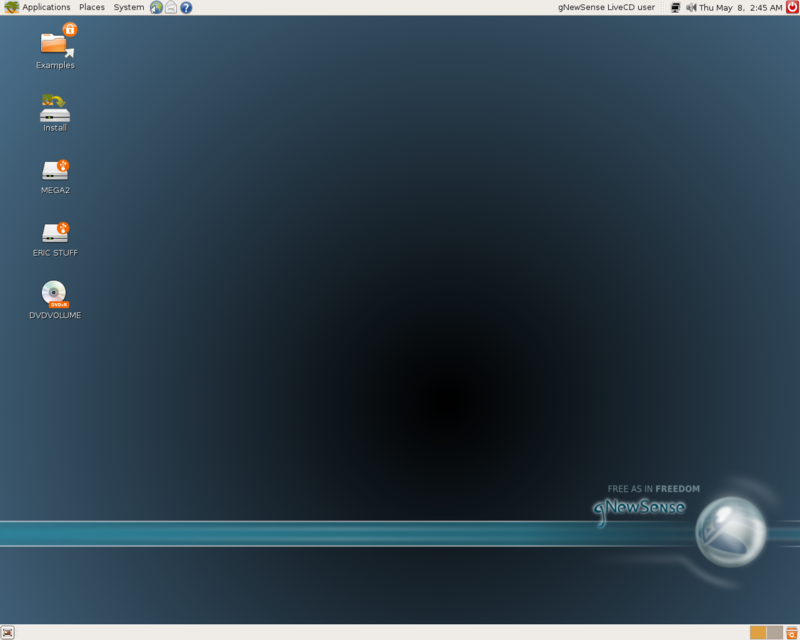 I mentioned in my last review that I thought it was wierd that gNewSense came with Firefox and not IceWeasel. Well, the Free Software Foundation (FSF) appears to have skirted the issue this time around because they just included Epiphany instead. This way they get to use the standard Gnome browser without worrying about explaining IceWeasel and Firefox and all that ridiculousness. The GIMP is still included – no reason for them to remove it. Ditto for Emacs. To keep things consistent with the last review I loaded up gNewSense 2.0 (deltah) onto my Windows computer. gNewSense was able to mount my NTFS external hard drive without any problems as well as detecting my NTFS internal hard drives. This remains unchanged from last time. The examples folder was also included again on this release. These are examples of common tassk which may be completed using the included software. Strangely, they included the GPL v2 again even though the GPL v3 has been out for, I think, almost a year now. To find out more about the examples files, see my previous gNewSense review. Overall, there isn’t really too much to report. Most of the same software is there – just updated to the latest version. I’ve read that most of the changes were under-the-hood (or bonnet, if you like) and wouldn’t be noticed by most users. This version appeared to run a little slower off the CD, but that doesn’t really say much about how it’ll run installed. I still recommend it for anyone who wants a completely pure Linux version with the simplicity of Ubuntu. This can also be achieved by using Fedora, Debian, and Mandriva Free and not enabling any repositories containing non-free software. I’d recommend it to anyone who, as they say on LugRadio, Loves Freedom. (By the way, it appears to have incorrectly detected my keyboard because when I try to put quotes I get the @) Freedom-Haters shoudl stay away as other reviews I’ve read seem to imply that you can’t start off with a gNewSense install and enable the non-free repos. I think they’ve changed some settings in the kernel or elsewhere to make it next to impossible to install such software. 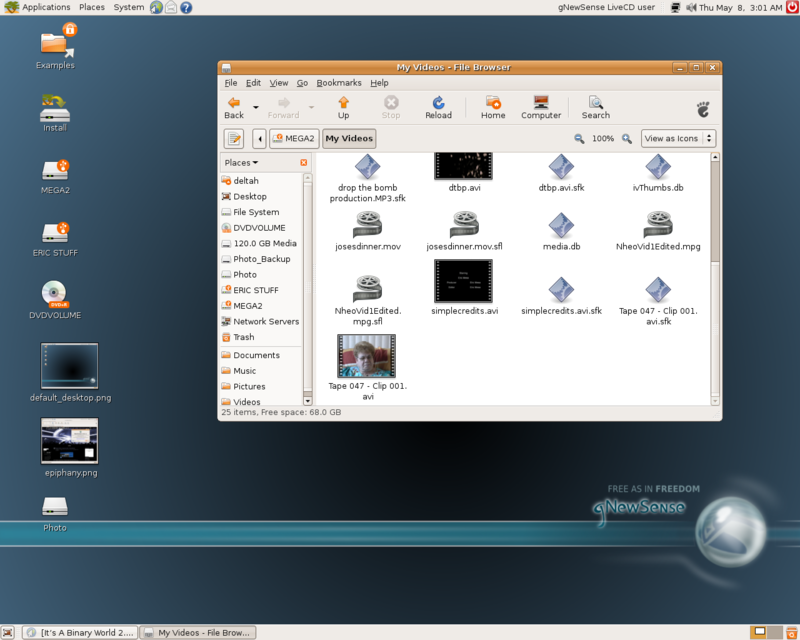 gNewSense 1.1 included a modified version of firefox, called burning dog, for the same reasons that debian uses iceweasel. I don’t know why they did include firefox in the 1.0 version, as I was not using the system at that time. The plan was to continue using burning dog for this version, but there was no time to make it into the release, so they went with epiphany instead. Also, the developers didn’t make any modifications to the kernel or anything to prevent the user from installing non free software. Anyone can install just what they want (though we hope they don’t). It’s true, however, that there aren’t any non-free repositories for the distribution… that’s the whole point, right? Finally, this distribution is not developed by the FSF itself. They only support it an promote it as one of the few GNU/Linux distributions that is 100% free. Thanks for the clarifications. I didn’t try gNewSense 1.1 because I figured it would just be a small modification over 1.0. My comments about the kernel being changed were based on another blog I read where he tried to compile in some non-free stuff. I wish I would have saved the link. Also, thanks for the clarifications about this not being an FSF distro. I thought it was since it had “gnu” in it and since it was endorsed by rms. Also, some remarks by Shuttleworth made it seem as though it was an FSF project. I was contacted by a gNewSense dev about the keyboard issue. He told me that rather than your keyboard being detected incorrectly (mine defaulted to English-UK rather than my preferred English-US) it’s not detecting anything at all. He said that the devs who spun the LiveCD were in the UK and their keyboard settings carried over. Just FYI. Strangely, they included the GPL v2 again even though the GPL v3 has been out for, I think, almost a year now. This is basically a hold over from Ubuntu. However, I don’t think this is exactly a bad thing. The GNU GPLv2 will be in use for a long time to come since Linux itself is v2 and won’t be changing. Well, the Free Software Foundation (FSF) appears to have skirted the issue this time around because they just included Epiphany instead. This way they get to use the standard Gnome browser without worrying about explaining IceWeasel and Firefox and all that ridiculousness. It’s already been said, but the FSF doesn’t make gNewSense. They provide web hosting for the project as they do for several other Free Software projects. The choice of Epiphany wasn’t to avoid the IceWeasel thing, honestly. The short answer is that Builder (a tool used to make the distro) simply hasn’t been ported to handle Firefox 3 source code yet. This is partly due to the fact that it’s not even released yet, but also because the idea was to get a spin of deltah out the door quickly after Hardy’s release. Community builds of IceWeasel may appear shortly, or BurningDog may make a return, depending on which gets the most support and maintainance. This can also be achieved by using Fedora, Debian, and Mandriva Free and not enabling any repositories containing non-free software. In short, no it can’t. gNewSense’s policy is based on the four freedoms mentioned in the Free Software Definition. For this reason it goes beyond simple license issues and into freedom itself. Debian, even with the DFSG, ships GLX in it’s Xorg packages. GLX is non-free software but removing it breaks a LOT of functionality. This “non-free in Debian” bug has been open for 4 years and been ignored in 2 stable releases (sarge and etch). As far as I know, only BLAG and gNewSense remove GLX. gNewSense also removes binary firmware and microcode which can’t be studied by a human and learned from. Even when some of these binary blobs are licensed as Free Software you’re not really free to practically exercise those freedoms so gNewSense removes them. This is why, even if the kernel sources were installed on the other review you read, nVidia’s stuff would be useless. Probably Maurice’s review over at Techimoe. I contacted him after I read the review and he’s added some additional comments. His review also indicated a few bugs which I plan to work out. Anyway… Free Software is about giving the user control of his or her computer. The ideas of freedom mean that a user must be able to install non-free on their system and gNewSense recognizes that freedom. There are no steps taken to prevent people from installing non-free. However, that said, there are some cases (3D being the big obvious example) where the removal of non-free (GLX) actually DOES make it harder (i.e. Impossible) to install other non-free. Though, in all fairness, installing gNewSense and then adding non-free is kind of a waste of time. The idea is to have a fully free system that is functional. If you can’t function without non-free, Ubuntu really does offer some convenience until you’re able to eliminate that non-free dependence. Sorry it took me so long to approve your comment – apparently Akismet thought it was spam for some reason. Luckily I started trawling through there recently to double-check. I wonder how many other comments I’ve missed in the past. As far as the GPL v2, I wasn’t so much saying that it’s a bad thing to have it as I was saying it was strange not to have GPL v3, that is, as you and others have noted, because I incorrectly thought this was an official FSF project. 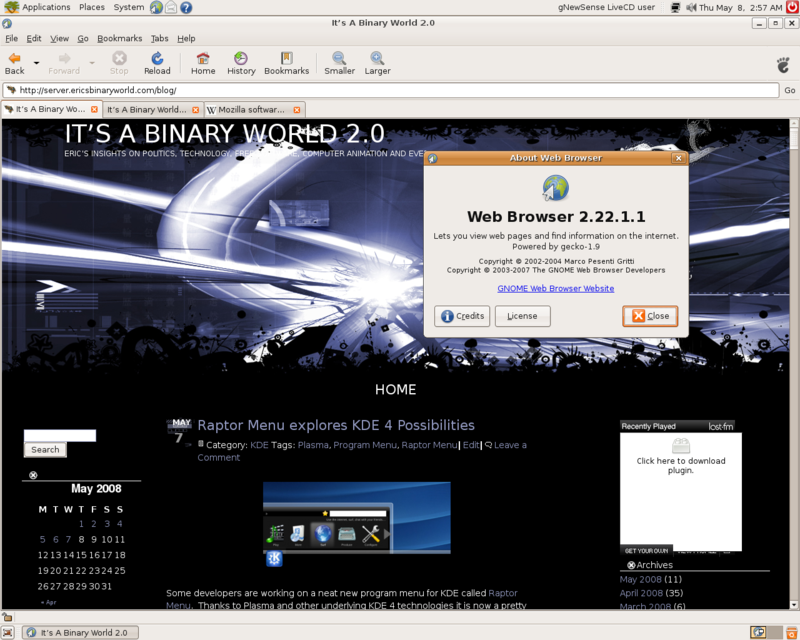 As far as Firefox, Burning dog, and IceWeasel – personally I think Epiphany is the best way to go. It’s the default Gnome browser and it avoids the other problems. The only bad thing about Epiphany is that it doesn’t take Firefox extensions. I’ve been using Epiphany exclusively on my Linux box for about a year or so now. I’ll have to do some research on GLX. Suse came up with that, didn’t that? And Fedora had AIGLX. Are the both unfree? If not, why not use AIGLX. Also, what’s GLX doing in X.org if it isn’t free. And why is this the first time I’ve heard about this? I’ve heard about the binary blogs a million times before, but never about GLX. I’m also really shocked that Debian with all that rigmarole about not being able to include certain man pages (or something like that) just because they had an invariant clause and then they’d go around and have GLX in there?!? But, I think that, other than that, I’d feel fine telling people that Debian was more or less a-ok. Fedora’s also pretty strict – they refuse to have nVidia in there even though it would allay a lot of people’s problems when they first used it. Still, I know that Fedora and Mandriva Free are less free. I stand (somewhat) corrected.